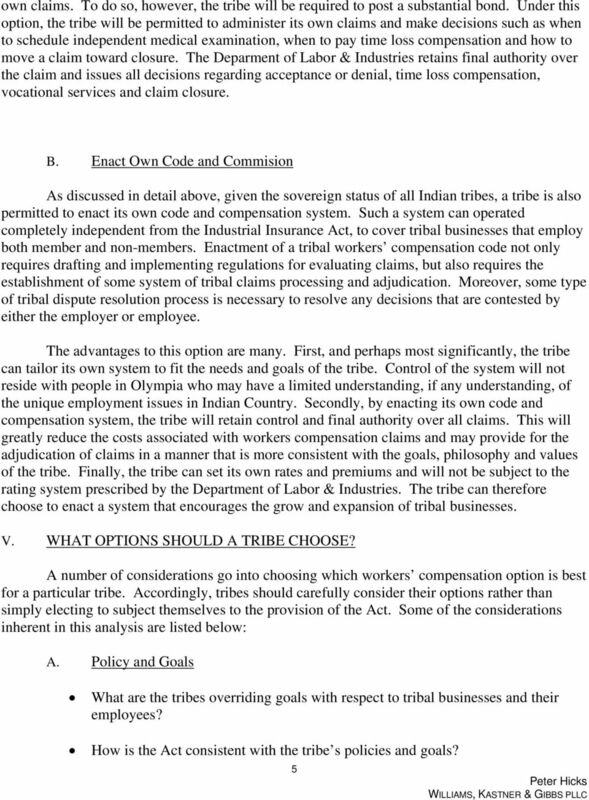 Download "WORKERS COMPENSATION OPTIONS FOR TRIBES IN WASHINGTON STATE"
TITLE 5 - REGULATORY PROVISIONS CHAPTER 5-1 5-1-1 Authority and Purpose (a) The authority for this Chapter 5-1 and its adoption by Tribal Council is found in the CLUSI Const. Art. I, section 1 and Art. 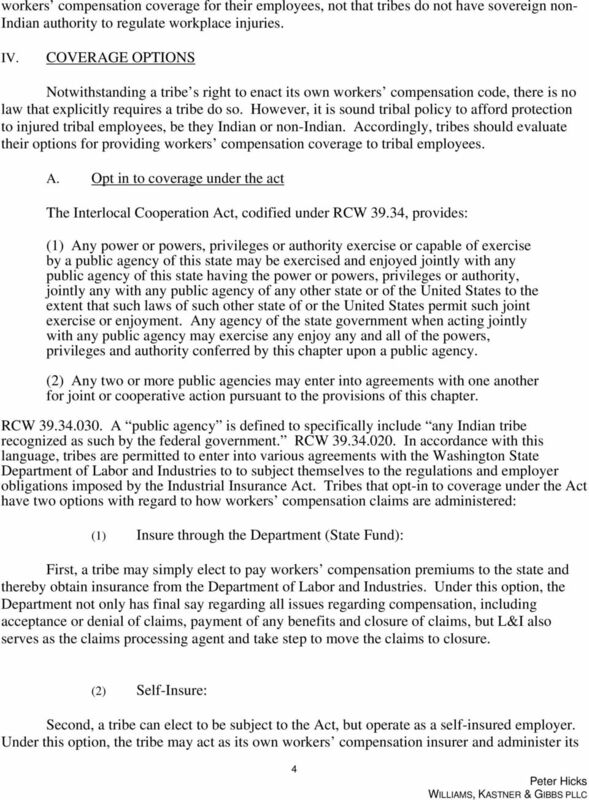 Question: Are Tribal Courts Different than State and Federal Courts? Anderson Brothers, Inc. v. St. Paul Fire and Marine Insurance Co.
ST. MARY S REGIONAL MEDICAL CENTER BATH IRON WORKS. 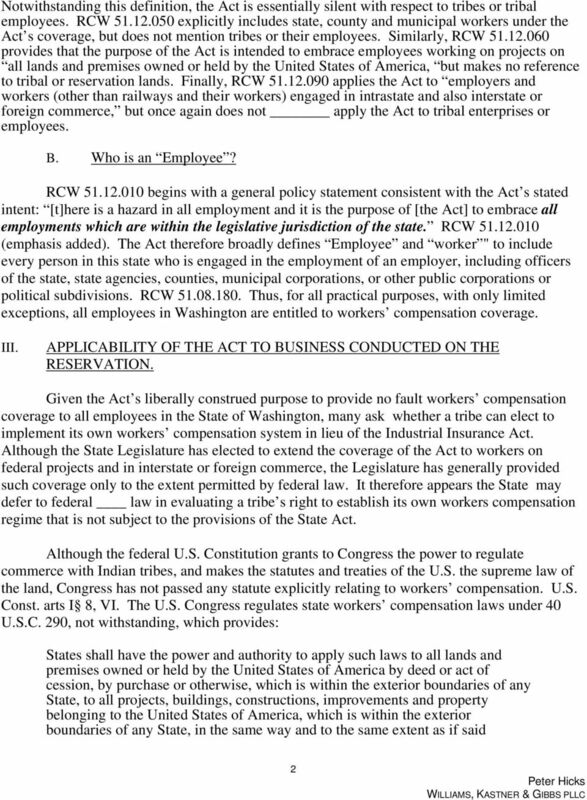 treatment costs pursuant to the Maine Workers Compensation Act, 39-A M.R.S. 58-84-10 through 58-84-20: Repealed by Session Laws 1995 (Regular Session, 1996), c. 747, s. 6. 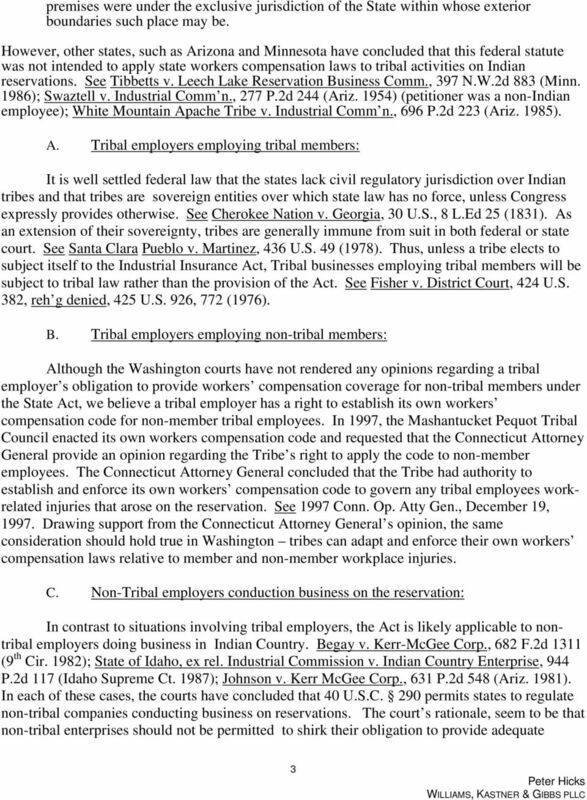 Employers Mutual Insurance Co. (:MEMIC) and by defendant Yarmouth Lumber Inc.
on Native American Projects Roger S. Owers, Esq., Sacks Tierney P.A. Lawrence F. McMahon, Alliant Insurance Services, Inc.
THOMAS B. ALEXANDER WILLIAM M. GAGE DISPOSITION: AFFIRMED - 11/14/96 MOTION FOR REHEARING FILED: 12/4/96 MANDATE ISSUED: 2/6/97 EN BANC. No. 110,315 IN THE COURT OF APPEALS OF THE STATE OF KANSAS. KANSAS DEPARTMENT OF REVENUE, ALCOHOLIC BEVERAGE CONTROL DIVISION, Appellee. No. 110,315 IN THE COURT OF APPEALS OF THE STATE OF KANSAS KITE'S BAR & GRILL, INC., d/b/a KITE'S GRILLE & BAR, Appellant, v. KANSAS DEPARTMENT OF REVENUE, ALCOHOLIC BEVERAGE CONTROL DIVISION, Appellee. Case: 09-1166 Document: 00319804259 Page: 1 Date Filed: 09/09/2009 UNITED STATES COURT OF APPEALS FOR THE THIRD CIRCUIT. No. Upon consideration of the motions for rehearing, the original opinion heretofore filed is withdrawn and the following substituted therefor. CHAPTER 234 HOUSE BILL 2131 AN ACT AMENDING SECTIONS 12-348, 41-1007 AND 42-2064, ARIZONA REVISED STATUTES; RELATING TO TAX ADJUDICATIONS. 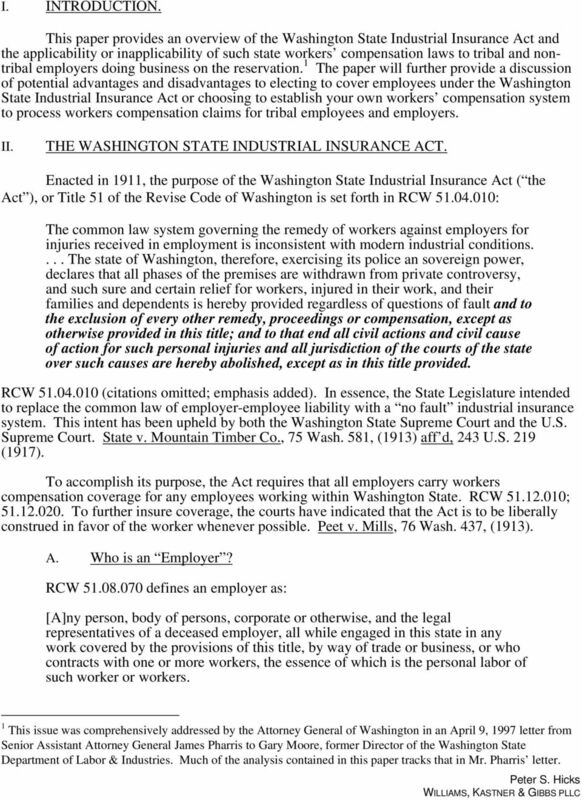 Case 1:08-cv-00225-EJL-CWD Document 34 Filed 03/02/10 Page 1 of 12 IN THE UNITED STATES DISTRICT COURT FOR THE STATE OF IDAHO OREGON MUTUAL INSURANCE COMPANY, an Oregon corporation, Plaintiff, Case No. SUPREME COURT OF ARIZONA En Banc PEOPLE'S CHOICE TV CORPORATION, ) Arizona Supreme Court INC., a Delaware corporation, ) No. CV-01-0156-PR ) Plaintiff/Appellee, ) Court of Appeals ) Division One v. ) No. Whose Responsible For Financial Responsibility? Whose Responsible For Financial Responsibility? NC Court Holds Liability Policy for Commercial Vehicle Automatically Provides Minimum of $750,000 of Coverage, Despite Owner Request For Lesser Coverage. YJ (3 IN THE SUPREME COURT OF FLORIDA INTERNATIONAL BANKERS INSURANCE COMPANY, Petitioner, Case No. 73,488. vs. SUSAN ARNONE, Respondent. 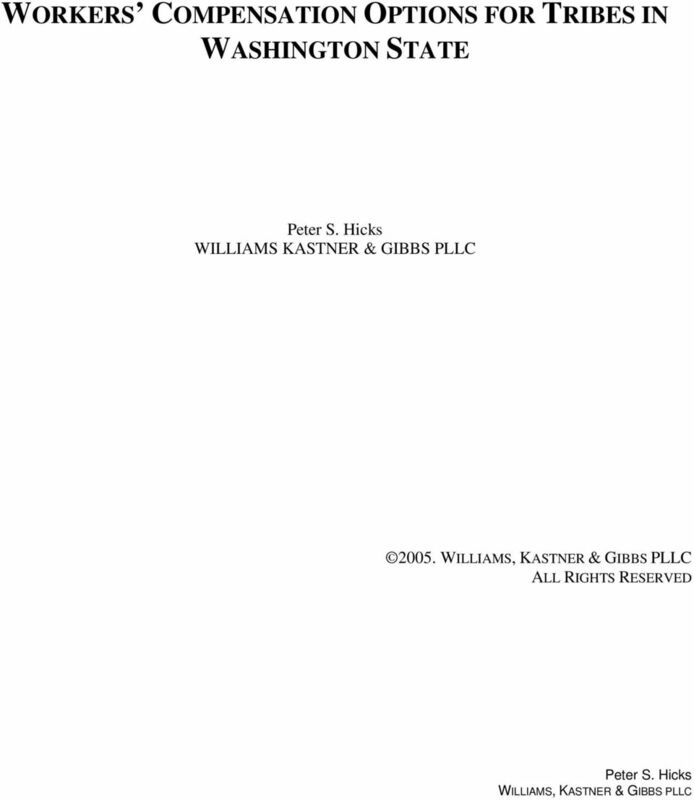 Case 3:12-cv-01348-HZ Document 32 Filed 03/08/13 Page 1 of 8 Page ID#: 144 IN THE UNITED STATES DISTRICT COURT FOR THE DISTRICT OF OREGON PORTLAND DIVISION KELLY J. YOX, an individual, v. Plaintiff, No. This opinion will be unpublished and may not be cited except as provided by Minn. Stat. 480A.08, subd. 3 (2006). Filed 3/22/16 CERTIFIED FOR PUBLICATION IN THE COURT OF APPEAL OF THE STATE OF CALIFORNIA SECOND APPELLATE DISTRICT DIVISION ONE CALIFORNIA INSURANCE GUARANTEE ASSOCIATION, Petitioner, B263869 (W.C.A.B.